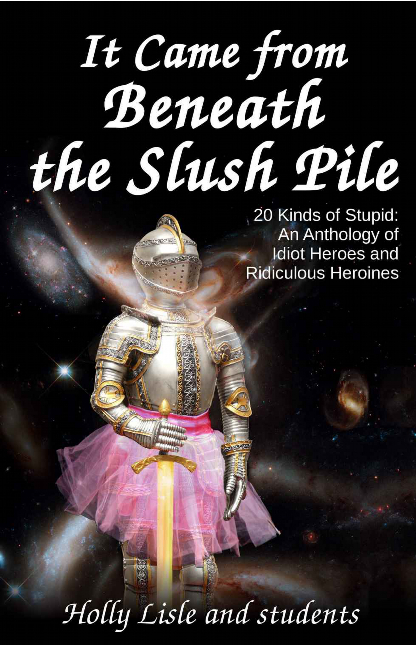 20 Kinds of Stupid: An Anthology of Idiot Heroes and Ridiculous Heroines. Fatally flawed flash stories by Holly Lisle and students. I wrote two and co-wrote one of the twenty stories in this little anthology. And it was terrific fun to throw off all the usual literary shackles of grammar, punctuation and storytelling decency, and literar-ally run amuck. I felt like Mark Twain frolicking in his oh-so-wrinkly birthday suit on the sands of Miami Beach! And after I joked that I’d put a knight in a tutu on my book covers if that would sell my books, my co-authors decided to give that a try. Of course, being FREE didn’t hurt. And it is a bit of a blow that my only best-seller to date earns me zip and mocks the real books I write. But hey, at least we all had fun! Now you, too, can get the book FREE from one of these online booksellers! And thanks for being My Reader!